The London School of Economics and Political Science (LSE) is a specialist constituent college of the University of London. Located on Houghton Street in Westminster, off the Aldwych and next to the Royal Courts of Justice and Temple Bar, in the City of London, it describes itself as 'the world‘s leading social science institution for teaching and research'. LSE was founded in 1895 by Fabian Society members Sidney and Beatrice Webb, Graham Wallas, and George Bernard Shaw, with funding provided by private philanthropy, including a bequest of £20,000 from Henry Hunt Hutchinson to the Fabian Society. The Fabians believed in advancing socialist causes by reformist rather than revolutionary means. The LSE was established to further the Fabian aim of bettering society, focusing on research on issues of poverty, inequality and related issues. This led the Fabians, and the LSE, to be one of the main influences on the UK Labour Party. The school was founded with the initial intention of renewing the training of Britain's political and business elite, which seemed to be faltering due to inadequate teaching and research - the number of postgraduate students was dwarfed by those in other countries. A year before the founding, the British Association for the Advancement of Science pushed for the need to advance the systematic study of social sciences as well. In fact, Sidney and Beatrice Webb used the curriculum of the Institut d'Etudes Politiques de Paris (best known as Sciences Po), which covered the full-range of the social sciences, as part of their inspiration for molding the LSE's educational purpose. LSE was opened in October 1895 at No. 9 John Street, Adelphi. The school expanded rapidly and was moved along with the British Library of Political and Economic Science to No. 10 Adelphi Terrace after a year. The LSE was recognised as a Faculty of Economics within the University of London in 1900. The school began enrolling students for bachelor degrees and doctorates in 1900, as it began to expand into other areas of social sciences, including international relations, history, philosophy, psychology and sociology. 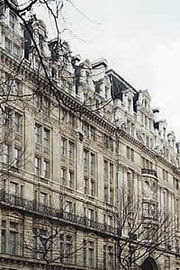 The school moved to its current site near the Aldwych - not far from Whitehall - in 1902. The Old Building, which remains a significant office and classroom building, was opened on Houghton Street in 1922. During these years and under the directorship of William Beveridge, future father of the welfare state and the National Health Service, LSE redefined the study of economics and the new conception of the study of economics as "a science which studies human behaviour as a relationship between ends and scarce means which have alternative uses" is looked to as the norm. LSE in this sense must be looked at as the father of modern economics studies. Under Beveridge, Friedrich Hayek was appointed as a professor and he brought about the ascendancy of the LSE through his famous debates with John Maynard Keynes. The famed Keynes-Hayek debates which occurred between Cambridge and the LSE still shapes the two major schools of economic thought today as nations still debate the merits of the welfare state versus an economy solely controlled by the market. LSE's influence upon modern economics is undeniable since it both formed the very basis for economic thought as well as shaped modern perception of free market economics. Hayek's works continue to influence the study of economics across the globe. At the other extreme, during these years Harold Joseph Laski, a professor of political science at the LSE was influential in British politics as an advocate of far left policies. Many renowned world leaders including John F. Kennedy studied under his guidance at the LSE. Anthony Giddens, the former director of the LSE stands as the creator of the 'Third Way' followed by both Tony Blair (who unveiled the Fabian Window at LSE in 2005) and Bill Clinton. His policy created a balance between the traditional welfare state and the belief in total free market economics. This policy is being put into effect by governments all across the world as free market economies continue to deal with wealth inequalities and bettering the welfare of the general population. The LSE is dedicated solely to the study and research of social sciences, and is the only university in the United Kingdom to do so. The School offers over 120 MSc programmes, 30 BSc programmes and 2 BA programmes (International History and Geography). Courses are taught in over thirty research centres and twenty-one departments, including Accounting and Finance, Management, Anthropology, Economic History, Economics, The Development Studies Institute, the European Institute, the Gender Institute, Geography and Environment, Government (Political Science), Industrial Relations, Information Systems, International History, International Relations, Law, Mathematics, Mannheim Centre for Criminology & Criminal Justice, Media and Communications, Operational Research, Philosophy, Logic and Scientific Method, Social Policy, Social Psychology, Sociology, and Statistics.Since these programmes are all within the social sciences they closely resemble one other and students often take courses in other departments. Many engage in a practice known as "auditing," where students attend lectures by professors whose classes they are not formally enrolled in. The intake sizes of many of the masters programmes are unusually large for this level, and some cohorts contain well in excess of 100 students. There is fierce competition for entry to the LSE, with approximately seventeen applicants for every available place at undergraduate level, making it the most competitive university in the UK for undergraduate admissions. Some courses, including law and economics are significantly higher than this, and in 2007 the approximate UCAS entry points were 476 (equivilent to AAAA at A-Level). Entrance standards are also high for postgraduate students (particularly for those seeking external funding), who are usually expected to have (for taught Master's courses) a First Class or Upper Second Class UK honours degree, or its overseas equivalent . The process of postgraduate admissions to the LSE is conducted on a rolling basis, as opposed to a deadline system. Applications are accepted from mid-October and the evaluation process begins in mid-November. Applications are considered as they "roll in" and the candidate can receive one of three outcomes; acceptance, rejection, or placement on a waiting-list/interim decision. LSE also offers the TRIUM Global Executive MBA programme jointly with Stern School of Business of NYU and HEC School of Management, Paris. It is divided into six modules held in five international business locations over a 16-month period. Whitefield Consulting Worldwide, a global MBA consultancy, has ranked the TRIUM Executive MBA programme as second worldwide. The Financial Times' most recent rankings of executive MBA programmes placed TRIUM as fourth worldwide. The LSE Summer School was established in 1989 and has expanded extensively with more than 3,000 participants in 2006, a similar number to the university's full-time undergraduate programme. The Summer School offers over 50 subjects based on regular undergraduate courses at the LSE, and takes place over two sessions of three weeks each, in July and August each year. LSE also offers the LSE-PKU Summer School in collaboration with Peking University. Courses from both Summer Schools can be used as credit against other qualifications, and some courses can be taken as part of a conditional offer for LSE Masters programmes.